With some good planning and strategically placed flights, you can get a lot out of Nepal in two weeks. Itineraries based around your own personal interests will ensure you get the most out of this time. From epic treks and river trips to towns rich in Nepal's diverse culture, here are four excellent itineraries tailored for two weeks in Nepal. Two weeks is enough time to undertake a serious and spectacular trek in Nepal. Which trek you can do depends on the exact number of days you have in Nepal. 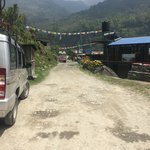 The below itinerary shows how to structure your itinerary around a 13-day trek, like the Manaslu Circuit. Keep in mind that that you will typically need 3 extra days in addition to the days you will be trekking to allow for pre- and post-trek logistics. Here are some treks we recommend, with the number of days needed: Manaslu Circuit Trek (13 trekking days, 16 days needed in Nepal), Dudh Kunda Trek (13 trekking days, 16 days total), Annapurna Base Camp Trek (12 trekking days, 15 days total), Gokyo Lakes Trek (12 trekking days, 15 days total), Annapurna Circuit Trek (12 trekking days, 15 days total), Nar Phu Valley Trek (9 trekking days, 12 days total). While Nepal is rightly famous for its premium trekking, it's also a favorite destination for white-water rafters and kayakers. Long rivers with varied landscapes, warm waters, easy-to-challenging rapids and white-sand beaches to camp on mean that the country is a perfect place for a multi-day river trip. Most trips can accommodate all levels of experience, from first-time rafters to experienced kayakers. The following expeditions can be fit into a two-week itinerary, and each has their own unique attractions. Western Nepal is remote and the infrastructure poor, so a 10-day trip down the Karnali River is an ideal way of experiencing this part of the country. The rapids are large on the first few days of this trip, then ease out later one. The water is a beautiful blue, the indigenous Raute people live in the area, and the trip ends near the Bardia National Park. If this river trip sounds appealing to you, don't wait too long: the Nepali government is planning to dam the Karnali River, despite objections from environmentalists and paddlers, so this trip might not be possible for very much longer. A 11-day Tamur River trip offers the best of both Nepali worlds: four days trekking followed by seven days on the river. 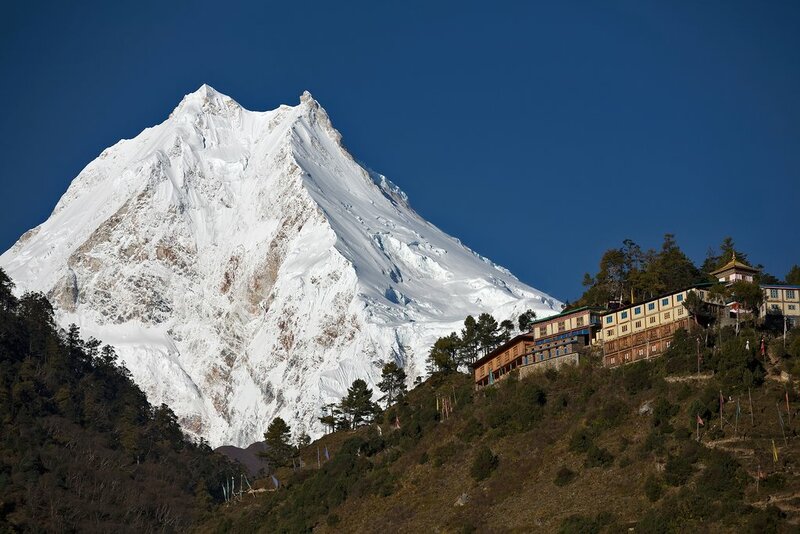 The trek climbs to over 3000 meters, and there are views of Mount Everest, Makalu, and Kanchenjunga. A highlight of the trek is camping in Gufal Pokhari, a beautiful high-altitude lake. The Sun Kosi is known as the River of Gold, and it's easy to see why with its sparkling white-sand beaches and shimmering water. The put-in point is conveniently near Kathmandu (about two hours' drive away), and you travel from high hills covered with terraced farmland to jungle that comes all the way to the water's edge, ending on the flat plains of Nepal's Terai. Nepal is a country of geographical extremes, and in two weeks you have enough time to experience them all: the high Himalayas, the mid hills, and the flat plains of the Terai. The following itinerary is especially suited to travelers who are less interested in outdoor adventure pursuits than cultural and historical attractions, with plenty of natural beauty in the mix. A similar itinerary that does include a short trek is Nepal's Golden Triangle. Start with a couple of sightseeing days in the capital, and fit in an early morning scenic Everest flight. 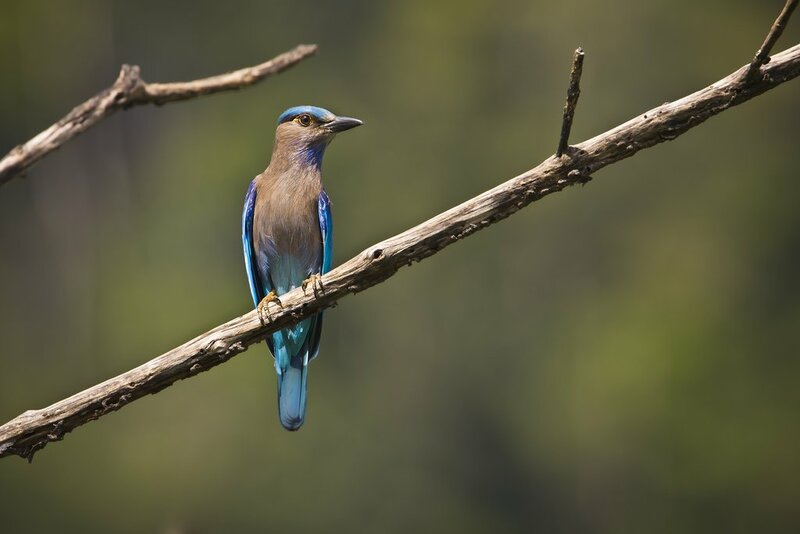 Travel down to the Chitwan National Park for some wildlife encounters, including one-horned rhinoceros, gharial crocodiles, elephants, and an abundance of exotic bird life. Head further west to Lumbini, the birthplace of the Buddha, where you can check out ancient ruins and the modern peace park. Travel back up into the hills and stop at Tansen, a Newari town that is famous for its traditional cloth weaving and the nearby abandoned Rani Mahal palace, on the banks of the Kali Gandaki River. 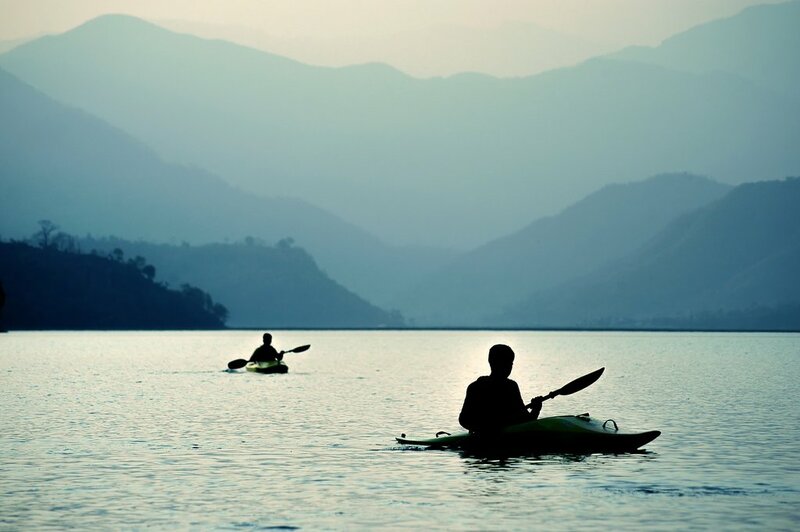 Continue on to Pokhara, a stunning lakeside city where you can chill out or indulge in adventure, as you prefer. Fly back to Kathmandu. For more details on a similar itinerary, check out Nepal's Cultural Highlights: 11 Day Tour. The isolation of many mountain communities in Nepal means that there is great cultural diversity within the country. While a bit longer than two weeks is required to visit some of the most remote areas (such as Upper Dolpo or the Far West), you can get a taste of a very different side of Nepal by visiting Lower Mustang. This region is in the rainshadow of the Himalayas and most inhabitants follow Tibetan Buddhism, so it is geographically and culturally very distinct from most other places in Nepal. After a couple of days sightseeing in Kathmandu, head west to the more peaceful city of Pokhara. 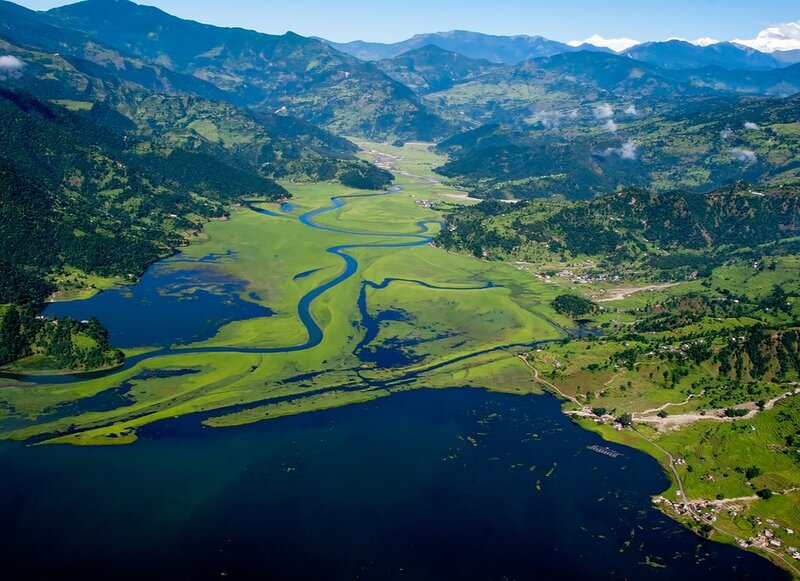 What the capital boasts in culture, Pokhara boasts in natural beauty and stunning vistas. You can chill out by the lake, enjoy some gentle activities such as boating on the lake or hiking or try something a bit more exciting, like paragliding. 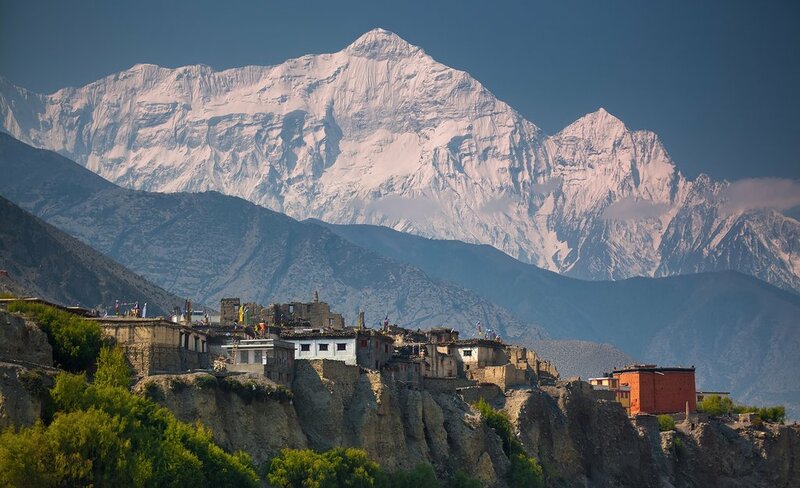 After Pokhara, take a seriously scenic flight to Jomsom, gateway to Lower Mustang. Explore around Jomsom, Marpha, Kagbeni, the sacred temple at Muktinath, and Lubra. Highlights of the area include Tibetan Buddhist monasteries, close-up mountain views, the vast Kali Gandaki Gorge, and centuries-old meditation caves carved into the cliffs. Return to Kathmandu via Pokhara and Bandipur, a spectacular and peaceful Newari town on a high ridge, then spend some time in the old city of Bhaktapur before departing. Days 1 & 2 Sightseeing in Kathmandu: Kathmandu and Patan Durbar Squares, Swayambhunath Stupa, Boudhanath Stupa, Pashupatinath Temple. For more great trip ideas, check out all of our 2-week Nepal tours and itineraries.